A classic shell top that literally matches anything. We love its smooth knit fabric, plus it easily layers under blazers, cardigans and leather jackets. Did we mention it’s also machine washable? Made in NYC. Cut for a loose fit, the fabric drapes softly away from the body while maintaining a flattering feminine shape. Our model in topaz is 5’9 ½” and wearing a size S. Our model in white and black is 5’8.5” and wearing a size S. Runs slightly large; if you are in-between sizes, we recommend sizing down. 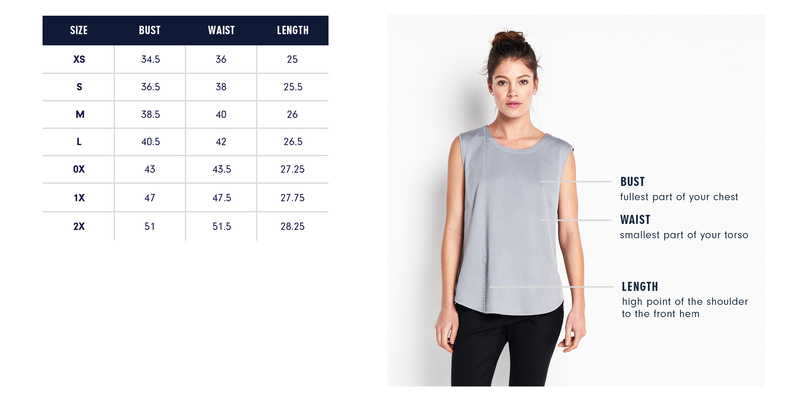 Below are the exact measurements of the Elizabeth Top. All measurements are in inches. For general brand fit, sizing, and measurements, please visit our Brand Fit & Size Guide. Cut for a loose fit, the fabric drapes softly away from the body while maintaining a flattering feminine shape. I wanted to design a shell top that works just as easily under a blazer as it does with jeans. The knit fabric has the relaxed feel of your favorite tee, but I elevated this style with the construction of the neckline and shirttail hem.